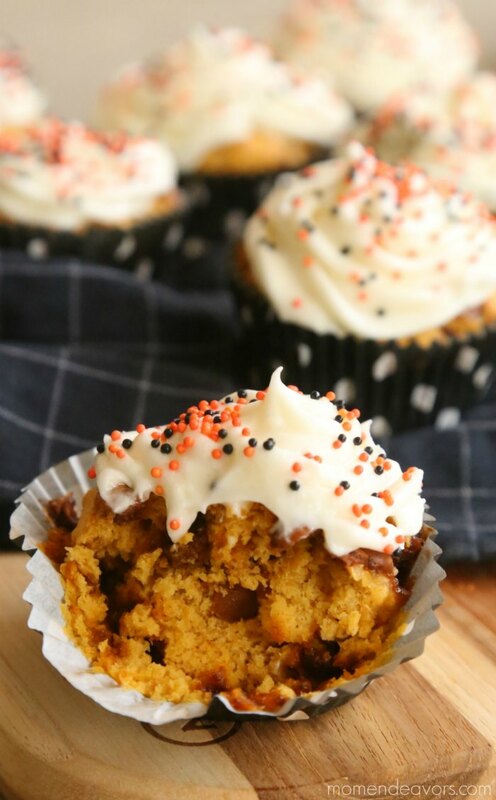 Super Easy Pumpkin Cinnamon Cupcakes! Mix the yellow cake mix and entire can of pumpkin. Nothing else! Just the cake mix powder & pumpkin. Combine well. Then, fold in the cinnamon chips. Scoop into your cupcake liners and bake at 365 for 20 minutes. That’s it!!! Once cool, frost with cream cheese frosting or step it up a notch and use this cinnamon cream cheese frosting recipe! YUM! 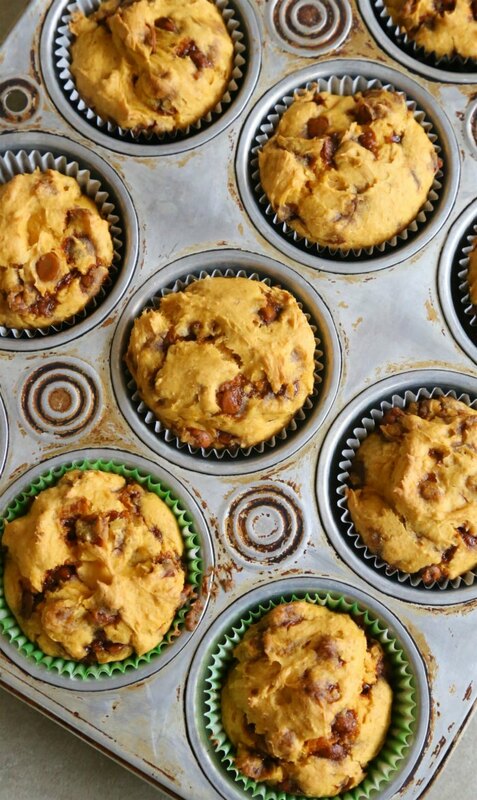 And, you’ll have scrumptious cupcakes that are somewhat reminiscent of a cinnamon roll! Mmmmmmmm! SOoooooo good! And they smell absolutely amazing while baking! YUM! Q1: What are cinnamon chips? Where do you get them? They are just like chocolate chips or any other kind of baking chips. They’re made by Hershey’s. The only problem is that they can sometimes be hard to find. Here’s a shot from another friend who found them at one of our local Walmarts. (Yes, my friends and I have actually been having facebook discussions of shopping for cinnamon chips, lol! The exciting lives we lead 😉 ) You can also find cinnamon chips here on Amazon (affiliate link). Depending on the store & the region of the country you live in, they might only be found seasonally. So, if you find some, stock up & keep them in the freezer! Q2: Where does the recipe come from? My friend’s mom has been making these for years & she got the recipe from a radio station in Lincoln, Nebraska! 🙂 I’m sure there are MANY variations and multiple sources. Q3: Can you alter the recipe? I’m sure you could. Maybe try a different cake flavor (I bet spice cake would be great) or less cinnamon chips if you want. Maybe even switch the whole thing up & use chocolate chips instead. Do you have any cinnamon chip recipes? Awesome!! Looking at them is making my mouth water :). Hopefully Tom will find the cinnamon chips at the Walmart by him tonight so I can make some more!! yum! i’ve never heard of cinnamon chips, looks like i have some baking and shopping to do! These look yummy!! 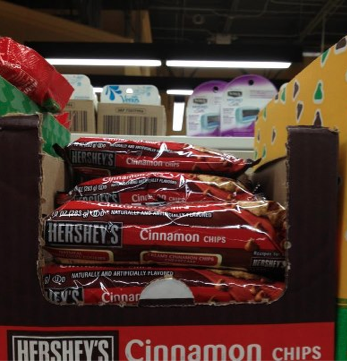 I’ve also never heard of cinnamon chips before…must try! Yes! Definitely stock up on a few bags if you find them. They seem to only have them out anywhere this time of year! Oh. Em. Gee. I just made these with spice cake and they are so outrageously good – and they are not even frosted yet. You are a genius! How fun! I’d thought about making them with spice cake, but hadn’t tried that yet. Clearly, I need to give it a go! thanks so much for stopping by & sharing! could these be made into mini loaf breads? so I’m confused…you dont need to add the eggs or milk or butter or anything?? OMG, these cupcakes look great! Plus, I just so happen to have a bag of cinnamon chips. I know what I will be doing next weekend. Can’t wait! Hi! These look amazing. 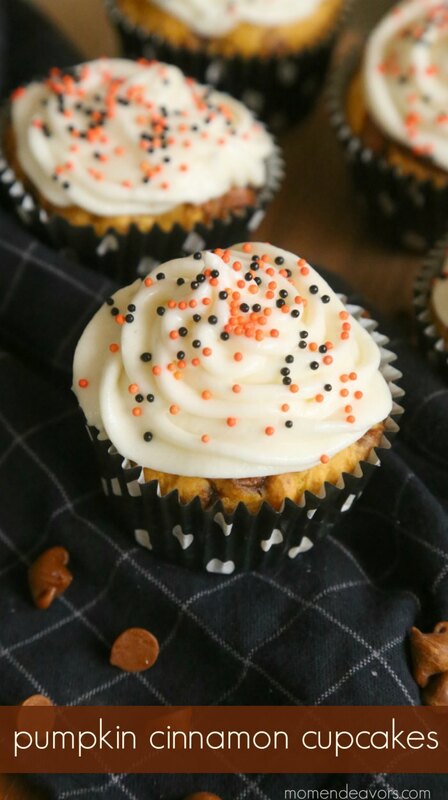 How do you recommend I alter the recipe to make these into mini cupcakes?